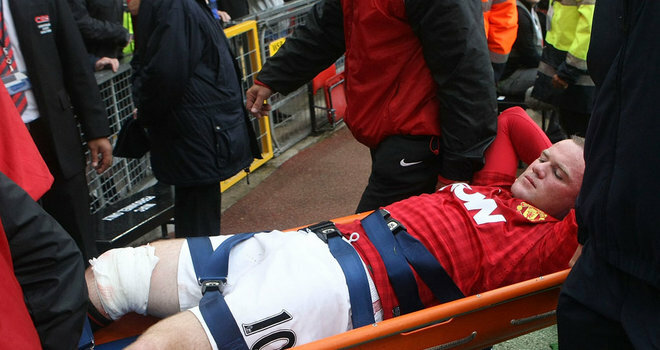 During Manchester United’s 2-1 victory at home to Fulham Wayne Rooney was stretchered off with an injury to his leg. While contesting a 50/50 the cleat of Fulham’s Hugo Rodellega gashed Rooney’s thigh just above the knee. The injury looked to be rather severe and will most likely require several stitches and several weeks on the bench. Hopefully Rooney will be able to make it back quickly, however his loss will make the purchase of van Persie (who got his first goal in a United jersey today) look even more brilliant. A month without Rooney would’ve been highly detrimental to United last season at this time. This year they will miss him, but hopefully this means he will be hitting his form towards the end of the season and they have the additional forwards available to fill in. He looks set to miss 3 Premier League matches, with the most crucial game being the September 23rd match versus Liverpool.